Home Audiology	Student Loans Part 2: Is Public Service Loan Forgiveness for You? Start at the top of the graphic. This portion of the decision-making process covers work setting and loan type pre-requisites—think of these as your table stakes. Many ASHA members who entered the workforce in the past five years will meet these requirements. For tips regarding these qualifiers, visit part one of this series. The first interesting question comes for those of you with Perkins loans. Does it make sense for you to consolidate? This is important. Perkins loans come with their own cancellation program far exceeding the PSLF opportunity. We’re talking portions of the loan erased each year with 100-percent cancellation in the fifth year. Salacious! This benefit gets lost if you consolidate your Perkins into a Direct Consolidation loan. If you work in a Title 1 school, please research your Perkins cancellation program options as part of your repayment strategy. Moving forward, the final quandary for every would be PSLFer to consider revolves around the payment plan and your student loan balance-to-income ratio. All the income-driven repayment plans are calculated as a percentage of your income. In the past, that meant if you had a low loan balance and a high income, PSLF may not have worked, because the calculation resulted in a payment higher than the standard 10-year payment. In this scenario, there’s nothing left for forgiveness under PSLF. A potential solution arrived with the introduction of REPAYE. This income-driven plan requires very few qualifiers, REPAYE isn’t right for everybody. That said, scenarios exist where people meet all PSLF qualifications, but pursuing this route may not be the optimal strategy. Your average interest rate, income, loan balance and future life events all play a role in deciding this outcome. My general rule of thumb is, if your federal loan balance equals half of your annual income or less, you should try and estimate your future payments to judge whether any balance would be left for forgiveness and compare that to alternative plans such as refinancing, or paying them off in full. If you can move through the graphic and answer all questions cleanly and correctly, then move forward. Public Service Loan Forgiveness is a long journey, but for the right hearing and speech professional it’s a very worthy pursuit. Moving forward? 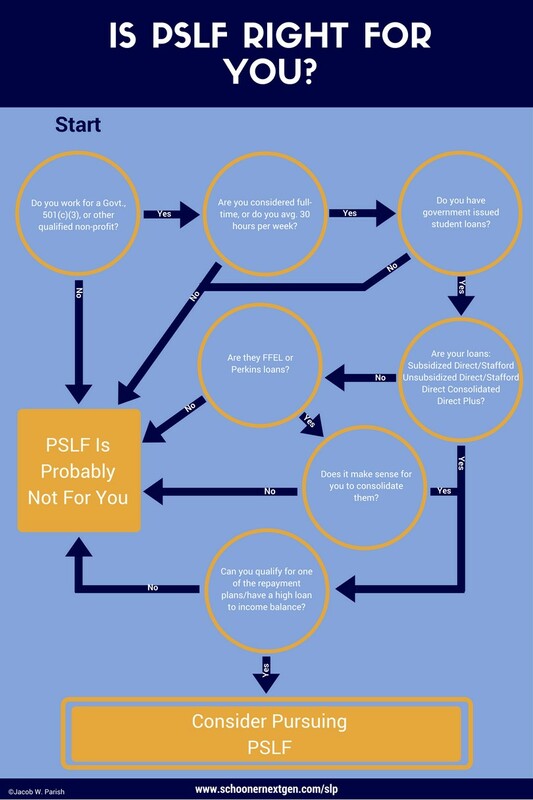 These six advanced tips for PSLF will help you on your way. When Is Treatment for Stuttering ‘Completed’? I might have missed something, but I’m confused why neither Part 1 or Part 2 of the navigating loan forgiveness articles mentioned the Teacher Loan Forgiveness program (https://studentaid.ed.gov/sa/repay-loans/forgiveness-cancellation/teacher). This website states that individuals providing Speech-Language Pathology and Audiology services in a Title 1 school would qualify for that program. To me, that program seems better, because you only have to make payments for 5 years, instead of the 120 payments you have to make for the Public Service Loan Forgiveness Program. Am I totally missing something?? -Most SLPs/Audiologists do not qualify. If you dig deeper into the rules it states individuals must be “highly qualified”. One part of the “highly qualified” definition is that you must have a teaching certificate. On the same page you linked to, it also talks about Teacher Cancellation which is another copletely seperate program that applies only to Perkins Loans. SLPs/Audiologists do qualify for this and I mention it in the post. However, it is specifically for Perkins Loans only. Not all SLPs work in schools. Hospital/Government SLPs do not qualify for the Title 1 school loan forgiveness. I believe this article is specifically discussing the PSLF program which is complex and there are some risks to entering the program. Do you have to work for a qualifying employer the entire time you are in repayment? Or is there a guideline about how long you need to work for the qualifying employer? Let’s say I worked for a variety of employers during the repayment of my student loans—how long or at what point do I need to work for a 503c to qualify? You need to work for a qualifying employer for all 120 payments and at the time of actually applying for forgiveness. It does not have to be the same employer as long as they all qualify. Is there someone available to help me navigate this? I work in the school system as an SLP, have my CCCs and a teaching certificate. I graduated with masters in 1998 and have been paying my student loans since then. I gave betwee 12-17,000 left I believe. If you’re interested in getting personal help please feel free to email directly, jacob@schoonerfn.com and we can discuss it further.